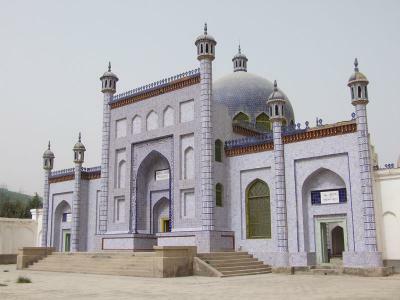 Originally built in the middle of the 11th century and located on the south side of Sports Road in Kashgar City, Tomb of Yusup Khass Hajip covers an area of 965 square meters. It is the resting place for Turkic poet Yusup Khass Hajip in the mid-11th century, and scholar. He was born in 1019 and passed away in 1080. He finished a long narrative poem "Kutadgu Bilig" with more than 13,000 lines. This poem is rich in content and vivid in language. It involves politics, economy, literature, history, geography, mathematics and medicine. It is a large historical document that has had a great impact on the literary creation of later generations and has received the attention of historians at home and abroad. Tomb of Yusup Khass Hajip is a group of buildings rich in Uyghur traditional architectural art. The main entrance of the cemetery faces south. In addition to the central courtyard, the cemetery can be divided into two parts: the east part and the west part. There is a worship hall in the west with a large dome. There is a carved ceiling in front of the hall and a prayer room behind. The tomb of Yusup Khass Hajip is situated in the east. A huge gatehouse in the front is 8 meters wide, 9 meters high and 3 meters deep, followed by the main tomb. The façade of the tomb is square while the inner is round. The top is curved. A small tower stands in the middle of the top. It is some 11 meters tall. Under the tomb of the colored glazed tiles in the middle of the inner is the resting place for the great poet. The façade is decorated with blue-and-white glazed bricks. Moreover, there are more than 10 towers (Bunker buildings) among the eastern buildings, which is rare in Xinjiang. The towers are beautifully built and decorated. There are high and low buildings standing there in a line. It is a rare highlight among the Islamic architecture in Xinjiang, which presents the great skills of the Uyghur craftsmen in ancient times. You could visit the tomb at any time during the opening hours. A few buses pass by the tomb. Therefore, there are only a few optons. Take Bus 8, 14, 16 and Bus 22 to the Stop of People’s Park (人民公园). Then, walk along the Sports Road to the tomb. Interested in visiting the Tomb of Yusup Khass Hajip on a Tour? Wendy Wei Tours offers a variety of different packaged tours as well as custom tours including the Tomb of Yusup Khass Hajip, among other attractions and destinations. To find out more, please visit our Tours page or Contact Us directly to find out more.